In honor of Pete Huttlinger’s birthday today. In his too short of a lifetime, Pete did a number of things of which he was proud. Most of them were music performances–with the Houston Symphony, the Nashville Symphony, and at Carnegie Hall. Right up there, at the top of the list, was something that had nothing at all to do with music. 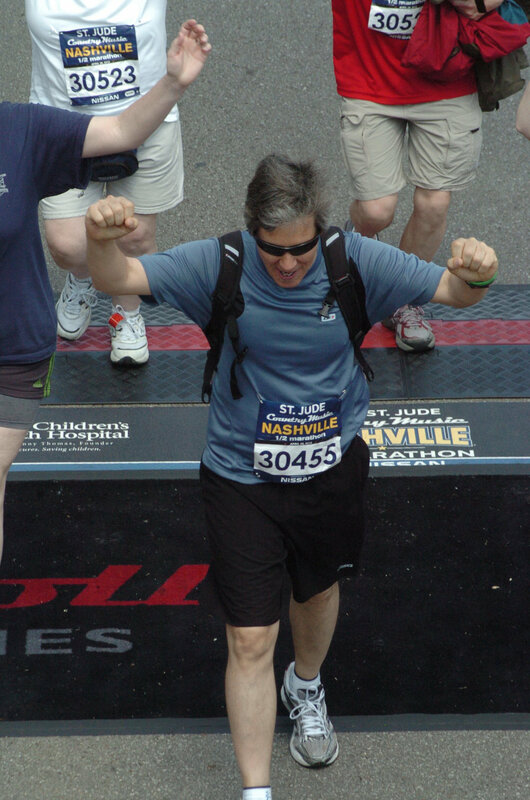 On April 29, 2012, one year to the date that he was life-flighted to Texas Heart in Houston, he walked 13.1 miles for the Country Music Marathon in Nashville. He was determined to do it and spent months training–with many ups and downs in the process. Pete wrote about it at length in our book, Joined At The Heart, so I won’t repeat the whole story here, but it was a huge and meaningful goal for him. He attached a lot of weight to his completion of the race with him achieving a full recovery from his stroke and heart failure. I walked it with him. I’ll be honest–It was not on my bucket list. But geez, if a guy with a heart pump is going to walk 13.1 miles, what kind of a loser wife was I if I didn’t walk it with him? A BIG one. We finished the course in just under four hours, alongside Pete’s brother, sister, cousins, cardiologist, and, as he would say, “25,000 of my closest friends.” It was a huge undertaking and a huge success. Pete beamed with satisfaction and as we went home, and I passed out while he launched into preparations for a big post-marathon party at our house without one complaint about aches or pains. He was told by some of his physicians that he was the first person to ever walk a half-marathon with a VAD (ventricular assist device). Four years later, a little more than three months after Pete died, I walked the half-marathon again. About six months earlier, Pete had enlisted our friends Alex and Monika to walk it with him. He was always encouraging people to do the marathon and make it a group experience. In fact, every April some of our friends, and fans, around the world, walk in solidarity and post pictures on social media. In 2016 Pete had passed away, but Alex and Monika were going to take the plunge too and they were a huge encouragement to me. Now, this year’s race was approaching. I knew if I did it, I would be setting a precedent for myself. I’d be locked in emotionally, and if I ever missed a year I’d feel like I was letting Pete down. About three weeks out from the race, James called to tell me he had signed up and paid for his registration to walk the marathon. He’s a college student, and it’s an expensive race. I was impressed that he had decided to be the next one in the family to climb this mountain. You’re right James. Now who’s next? Sean? Do you have traditions that you have carried on in honor of your loved one? I really love hearing from you. Add your comment below.